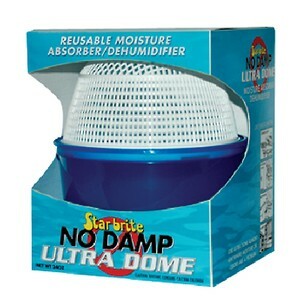 Starbrite's No Damp Dehumidifier Utlra Dome is full of Starbrites well known dehumidifier to make sure mold and mildew never get the green light in your boat. The super dry concentrated pellet formula is engineered to absorb more moisture per ounce than other flake formula boat dehumidifiers. The best part is the Starbrite Ultra Dome is reusable and can be transferred from boat to boat!